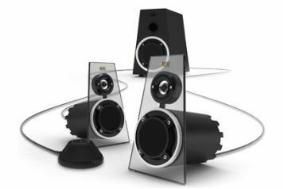 Altec Lansing shows off new Orbit USB speaker and Expressionist Ultra 2.1 system | What Hi-Fi? We were big fans of the InMotion IM4 iPod dock and more recently became confirmed enthusiasts for the company's Backbeat 906 Bluetooth headphones. Now it's the turn of the Orbit USB PC speaker and the Expressionist Ultra 2.1 speaker system to do their best to impress. You may recognise the Orbit USB as it follows in the footsteps of a similarly spherical speaker, the Orbit M, but is now powered, as the name suggests, via USB. This of course means you don't need any other source of power for the speaker when it's connected to your PC, so no running out of batteries mid-holiday. Due for release on the 1st October, the Orbit USB will set you back £40. Also new is the more substantial Expressionist Ultra, a 2.1 desktop speaker system that will sell for £179 and is again available to buy from October. A large subwoofer and two angular speakers are joined by a rotary wired remote control for adjusting the volume, and indeed treble and bass. There's 200 watts of power at your disposal from the unit which has a 3.5mm audio input on the sub unit plus an auxiliary input and a headphone out on the remote. Altec Lansing is rightly proud that all the components of its systems, drivers and all, are manufactured in house, and promise great things on the audio side. We have review units of both products in the building, so look out for a First Test of one of them in our December issue.